This very imposing, 36-story, beige-brick apartment tower is a rental with 442 apartments. It was erected in 1967 and designed by H. I. Feldman. The free-standing, L-shaped tower has rounded balconies at its corners and angled balconies on its sides. It caps its geometries with a nice cylindrical rooftop watertank enclosure. 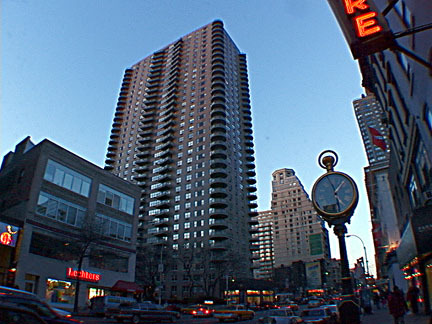 The building occupies the blockfront on Third Avenue between 85th and 86th Streets and since its construction it has been a prominent landmark in the Yorkville neighborhood. It has a large, lushly landscaped driveway designed by Klonsky Associates with a large circular marquee entrance on 85th Street and the tower rests on a one-story retail base. The building has a concierge, consistent fenestration, a garage, and discrete air-conditioners, but no health club. The building has many spectacular views from its upper floors. It has lush sidewalk landscaping at its driveway entrance and a midblock sunken retail plaza on 86th Street. It is very convenient to public transportation and not far from the many cultural institutions along Museum Mile on Fifth Avenue and many private schools in nearby Carnegie Hill. There is excellent local shopping and numerous movie theaters nearby and a noisy fire station is on the same block. 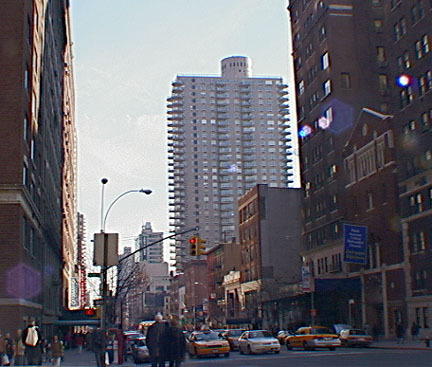 There is considerable traffic in this area and there are often many sidewalk vendors on the sidewalks by this building on the avenue and 86th Street. The building has a large lobby and concierge and a circular entrance marquee. The circular balconies soften this buildings great, bland mass, but the angled balconies are awkward looking. This is not a pretty building but it was an early harbinger of the tall-building renaissance of Third Avenue that began when the "El" was demolished in the mid-1950s and the era of German-style dance halls on Yorkville's main drag, 86th Street, began to disappear and give way to the gentrification of so-called "luxury" apartment high-rises. 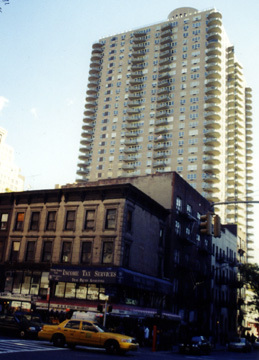 When it was erected in 1967, the Park Lane apartment building at 185 East 85th Street on the northwest corner at Third Avenue got a zoning bonus for providing a through-block passageway, partially sunken between 85th and 86th Streets. Last August, a former store in the low-rise building on the west side of the passageway was rented to Shake Shack, the popular burger joint that was started a few years ago by Danny Meyer in Madison Square Park. The restaurant has its entrance at 154 East 86th Street and when it opened it used most of the sunken plaza outside its space as an outdoor seating area for its patrons but blocked its southern entrance. In October, 2010, however, it opened the southern entrance and since then some neighbors have expressed concerns that the passageway should be closed at night rather than kept open 24 hours a day as mandated by the city's zoning regulations. A December 1, 2010 article by Amy Zimmer at DNAinfo.com said that Shake Shack "didn't start keeping the plaza open 24 hours until October, when they learned of the rule" that the plaza be kept open 24 hours a day. “There were beggars and peddlers,” recalled Elaine Walsh, Community Board 8 member and president of the East 86th Street Association, which notified the Shake Shack about potential problems when it started to keep the plaza open all night in October, the article said. "Shake Shack," the article said, "which sets up tables in part of the plaza, has no qualms about closing it from 11 p.m. until 7 a.m., said Jay Segal, a land-use attorney for the building. But it needs approval from the Department of City Planning. 'City Planning thinks at some point the plaza is best closed,' Segal told the community board. 'I’m 95 percent sure it will be closed. It’s just a question of timing.' The law, he said, mandates the plaza must be open for a year or have 'a demonstrated safety concern' before it can be closed at night." "Walsh said a police inspector from the 19th Precinct had stated at a Nov. 8 public meeting that the NYPD also wanted the plaza closed at night for safety reasons. City Planning has not yet received an application to close the plaza at night," the article added.